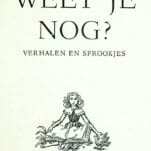 Weet Je Nog? (Do you Remember?). 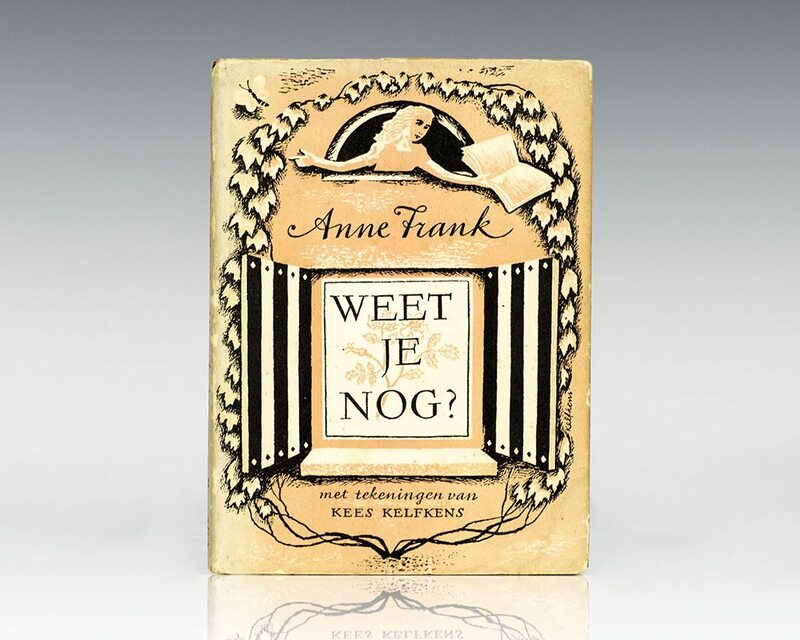 Rare First Edition of Anne Frank's Weet Je Nog? 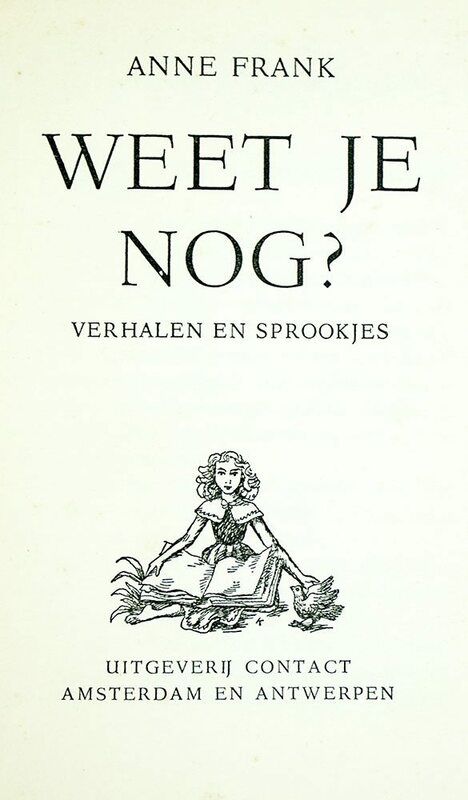 First edition of Anne Frank’s collection of stories and fairy-tales, written at the age of 14 while in hiding. Octavo, original illustrated boards. Near fine in a near fine dust jacket with light rubbing and wear. Illustrated by Kees Kelfkens. Rare in the original dust jacket. Born in 1929, Anne Frank received a blank diary on her 13th birthday, just weeks before she and her family went into hiding in Nazi-occupied Amsterdam. 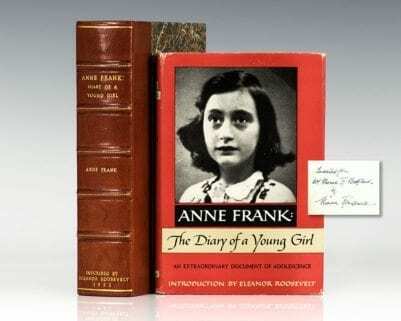 Here diary was later discovered in the attic in which she spent the last years of her life, Anne Frank's remarkable diary has since become a world classic—a powerful reminder of the horrors of war and an eloquent testament to the human spirit. In 1942, with Nazis occupying Holland, a thirteen-year-old Jewish girl and her family fled their home in Amsterdam and went into hiding. For the next two years, until their whereabouts were betrayed to the Gestapo, they and another family lived cloistered in the "Secret Annex" of an old office building. Cut off from the outside world, they faced hunger, boredom, the constant cruelties of living in confined quarters, and the ever-present threat of discovery and death. In her diary Anne Frank recorded vivid impressions of her experiences during this period. By turns thoughtful, moving, and amusing, her account offers a fascinating commentary on human courage and frailty and a compelling self-portrait of a sensitive and spirited young woman whose promise was tragically cut short. Also written to pass the time while in hiding, Weet Je Nog? is a beautiful collection of eight illustrated fairy tales which Frank began in 1943 and often read aloud to her family and friends in hiding. She wrote in her diary on 7 August 1943, "a few weeks ago I started writing a story, something I made up from beginning to end, and I've enjoyed it so much that the products of my pen are piling up." Frank, Anne; Introduction by Eleanor Roosevelt. Garden City, NY: Doubleday & Company, 1952. First edition, early printing with same date and imprint as the first American edition of “one of the wisest and most moving commentaries on war” (Eleanor Roosevelt). Octavo, original cloth. Introduction by Eleanor Roosevelt. Inscribed by Eleanor Roosevelt on the front free endpaper. Pictures of Anne Frank pasted opposite the inscription, near fine in a near fine dust jacket with light rubbing. Jacket design by Ursula Suess. This is the first example we have ever seen of this title signed and inscribed by Eleanor Roosevelt. Translated from the Dutch by B.M. Mooyaart-Doubleday. Housed in a custom half morocco clamshell box. Rare and desirable.